You can't recommend a comic to someone without context -- a broader sense of what they enjoy, in both comics and other media. In the Rec Room, ComicsAlliance uses the graphic novels, books, television and movies that you do know as a gateway to the great comics that you don't. If you like... "The Wire"
For fans of the HBO drama "The Wire," ComicsAlliance recommends DC's "Gotham Central" Vol. 1 HC. Ed Brubaker, Greg Rucka, and Michael Lark's vivid foray into the inner workings of the police department in Batman's hometown does something very similar to the award-winning TV drama: conveying the human realities of a city addicted to crime, and the consequences ifor those dedicated to fighting back. What "The Wire" does for Baltimore, "Gotham Central" does for Gotham City. But while "The Wire" gives equal face time to both the drug trade's criminal element and the cops tasked with hounding them, "Gotham Central" looks solely at the cops who clean up Batman's messes. Both work to invert the traditional approach of their genre; "The Wire" is a cop show about criminals, and "Gotham Central" is a superhero crime book about the men and women whom Batman leaves most defeated -- the police. Each is inherently adversarial, and that's what makes them so goddamn compelling. No mere police procedural, "Central" takes the time to develop the characters of the Gotham's maskless crimefighters, and the sometimes demoralizing effect those masked heroes have on them. Just as "The Wire"'s perspective fostered audience's empathy for even the most hardened of criminals, "GC" sheds a new light on the logistics of battling crime in cooperation with a prominent vigilante.In any story, it's easier to write off criminals as minor bit players; straw men for garishly dressed acrobats to thwart, tie up, and forget. Police suffer similar marginalization, inconsequential and ineffectual laborers more like scenery than protagonists unto themselves. But audiences crave innovative points of view, and both these works offer just that. In neither case are the enforcers able to defeat their opposition, but what audiences learn from each is that just staving off the darkness is burdensome enough task unto itself. If you like... "Captain America: Reborn"
Try... "Captain America: The New Deal"
For the fan of Ed Brubaker's "Captain America: Reborn," ComicsAlliance recommends John Cassaday and Ney Rieber's "Captain America: The New Deal." Both are stories about the reinvigoration and resonance of an American icon. "Reborn" is a literal resurrection -- the adventurous return of a hero lost to a world that needs him. The New Deal marked a symbolic return, a triumph of lost ideology, and the reclamation of a pious nationalism that marked a tumultuous flashpoint in time. The Ed Brubaker penned volume of "Captain America" has made Cap's iconic resonance a plot point central to the story's long format super-arc. In many ways, the death, replacement, and now rebirth of Captain America has proven that there is an emotional clarity to memory that the immediate present simply lacks. Things are more pure when remembered than when experienced, and Captain America is a character that's all about memory. He's about remembering the world as it was, as an eternally young member of the Greatest Generation. In the first act of Brubaker's "Captain America," the character was centrally haunted by the memory of his fallen partner. By the time he'd saved that lost partner, Cap himself was killed. Suddenly the series shifted into a story about his partner's memory of him, and America's united celebration of Steve Rogers as the once-Living Legend. Through his death, America was awakened to a deep connection with their favored son and their obscured idea of what America is supposed to be at its best: the American dream. But damned if it isn't one hazy-assed dream. "Captain America: The New Deal" was also a pretty big deal in its day. Marvel had put the Captain America title on hiatus for a few months after the events of 9-11, as Americans were forced to reevaluate the ties that bound them for the first time in a generation. The country was wounded, frightened in unison, and angry. Dressing oneself up in a flag became a hugely greater responsibility. As a character, Captain America had always served as the vessel of our best ideals, and in the blink of an eye he became as relevant as the moment he first graced the page, punching Hitler in the chops. Overnight, escapades staring Cap sparring with Batroc 'ze Lepaire lacked the dignity sufficient for the now weighty times. Suddenly, America's greatest enemy was international, philosophical terror. Therefore, terror was now Cap's greatest enemy. The iconography was all-important. 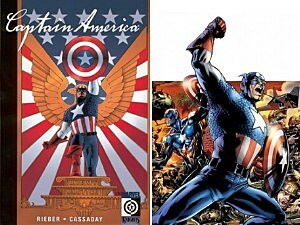 The Captain America title was revived, and the character was repurposed from just another hokey costumed hero to America's champion soldier. Through the magic of comics' literal metaphors, Captain America literally and figuratively rose from the rubble of the Towers, and battled back at the nightmares in the way America could only then collectively wish it could. That moment eventually passed. America's universal unification was fleeting, but for an instant in history, a people were one. "The New Deal" gets right at the heart of that moment, with Steve Rogers leading the charge. Both stories offer strongly different approaches to making Captain America matter, but the biggest difference between them is that one story turns inward, and the other outward. "The New Deal" isn't really an American metaphor; it's a pretty literal representation of the States for one historical point. The "Death of" and "Reborn" stories are all metaphor. Bru and crew pit Cap as the central allegorical tragedy that demarcates the end of an era. Here, he is the history. One takes 6 issues to tell a story about a momentary time and a place. The other takes 60 and encompasses generations. But they're both action thrillers, and they both satisfy the visceral needs of good genre fiction. These stories both go to great lengths to celebrate America, as we mean it to be. If you like... "Angels and Demons"
For the fan of Dan Brown's novel "Angels & Demons," ComicsAlliance recommends Dark Horse's "Revelations" by Paul Jenkins and Humberto Ramos. Murder mysteries set to divine backdrops, both prose and graphic, these two books are gripping page turners that focus on humanity's obsession with the greatest mystery of them all; the mystery of faith. A cynic might suggest that "Revelations" sought to capitalize on the Earth-tipping success of "The Da Vinci Code," Dan Brown's breakout religious thriller. But given that Brown was riffing on his own earlier work, "Angels and Demons," when he struck the symbology goldmine with "Da Vinci," acknowledgement of influence is an easily absolved sin. "Revelations" tells the tale of the Scotland Yard detective summoned to investigate a murder at the Vatican. A Cardinal has been killed, the pope is not long for this mortal world, and a conspiracy begins to unravel. ter to their respective mediums. Pensive introspection works well in a prose novel, where there is naught but words upon words to explore both plot and subtext. Graphic novel demand more action, as their visual narrative need a quicker sense progress and pace. An academic can suddenly recall some relevant bit of information from his years of study, but in a detective story, we need to be shown the evidence for the conclusions to resonate. This is perfect for comics, as comics show us that which novels tell us about. 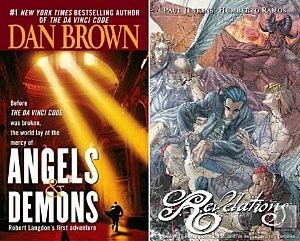 Though they share similar trappings, both "Revelations" and "Angels and Demons" take unique approaches in exploiting the vulnerable curiosities of faith. Each is less about religions themselves, or even the Catholic faith specifically, than about the impact and power these institutions have in our world. As mysteries, they're about questions -- the things that create humanity's need for faith in the first place.